SkyTruth just obtained several new photographs, taken from a nearby vessel shortly after the fire was extinguished, that clearly show the severe damage sustained by the Montara oil platform and the attached West Atlas drill rig. These photos are from an anonymous source, so SkyTruth can’t vouch for their accuracy. But they closely resemble this post-fire photo recently published in WA Today, and seem to be legitimate. A big thank-you to the photographer who took these shots and is allowing us to make them available to the public. Timor Sea Drilling Spill – What Happened? Still smoking: fire-damaged Montara platform (left) and West Atlas jackup drilling rig (right). The $250M rig is a total loss. See more photos at WA Today and in SkyTruth’s gallery. “This in my opinion was because they were trying to save time so they drilled to a certain depth and did not plug it securely because they did not expect flow. I’m not sure how much credibility to give this. A rig can only drill one well at a time, and these wells were going beyond 8,000 feet. It takes days to drill to that depth. So the information that “six wells were being drilled that morning” is suspect. Nevertheless, something certainly did go wrong on August 21, and the Australian government launched an investigation to discover the cause and evaluate possible weaknesses in their oversight of drilling, spill response capabilities, decisionmaking. Here in the U.S., where we’re on the verge of allowing new drilling in areas where it’s been off-limits for decades (such as Florida, the Carolinas, Virginia and parts of Alaska), folks are impatiently awaiting definitive word on what caused the Montara blowout. Some have suggested “it could never happen here.” Until we know the actual cause, we can’t draw any firm conclusions. But one thing is certain: a spill like this is extremely expensive. The $250M West Atlas drill rig has been destroyed. Replacing the damaged topsides of the Montara oil platform will cost at least $16M. PTTEP estimates the costs of the lost well and their response actions to approach $170M. Australian taxpayers have spent more than $5M for spill response activities so far, which ultimately may be repaid by PTTEP. What’s unknown at this time are the economic losses that could be suffered by Western Australia’s $8M fishing industry, and the potential for long-term damage to the environment. NGOs also claim significant damage in Indonesia, with reports of bankruptcy among the fishermen of Timor. Peter Garrett, Australia’s Environment Minister, is being criticized for defending what some characterize as a tepid government reponse to this major oil spill. A little irony here: Peter was lead singer for the group Midnight Oil (no joke). In the mid-80s he rocked my world with Power and the Passion. I jumped all over the room like a spaz whenever I heard that tune. I still do, only slower. More irony: in 1991 Midnight Oil played an illegal concert outside Exxon headquarters in New York to protest the Exxon Valdez spill. Check out the video. Sometimes you’ve got to take the hardest line. See all of SkyTruth’s photos, maps and satellite images of the Montara spill. Read all our blog posts on this subject. And please, help us out if you like what we do here at SkyTruth. We are a 501(c)(3) non-profit organization. https://skytruth.org/wp-content/uploads/2009/11/West-Atlas_WA-Today-fire.jpg 133 200 John Amos /wp-content/uploads/2016/08/test_logo.png John Amos2009-11-10 14:43:002019-03-05 11:07:08Timor Sea Drilling Spill - What Happened? Timor Sea Drilling Spill – Finally Stopped? 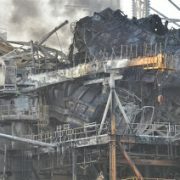 PTTEP Australasia is reporting that their fifth attempt to kill the leaking well on the Montara platform has succeeded, shutting off the uncontrolled flow of oil, gas, and natural gas condensate that has been polluting the water and air off Western Australia since the blowout occurred on August 21. 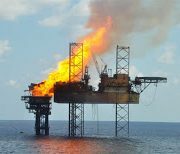 The fire that ignited over the weekend, engulfing the Montara platform and the attached West Atlas drill rig, has also been nearly extinguished. 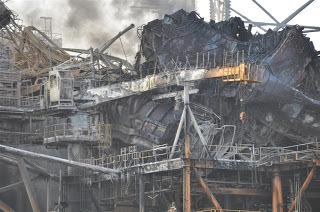 We do not underestimate the significantly increased technical complexity, logistical challenges and hazards of the work now required in the wake of the damage caused by the fire to the wellhead platform and the West Atlas rig. Estimates of the amount of oil spilled vary widely. PTTEP’s unexplained estimate of 400 barrels per day yields a total of 1,243,200 gallons. The Australian government’s estimate of “up to” 2,000 barrels per day means a total spill of as much as 6, 216,000 gallons. And an estimate of 3,000 barrels per day based on the known flow rates of other wells in the area results in a spill of 9,324,000 gallons, almost as large as the 11 million gallon Exxon Valdez spill that, 20 years after a massive cleanup operation, is still affecting Alaskan communities and the environment. Spectacular AP video of the platform fire here. /wp-content/uploads/2016/08/test_logo.png 0 0 John Amos /wp-content/uploads/2016/08/test_logo.png John Amos2009-11-03 19:09:002017-09-14 11:00:35Timor Sea Drilling Spill - Finally Stopped? 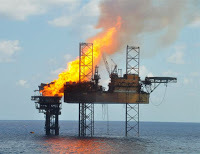 Montara / West Atlas platform and rig burning off Western Australia. Photograph from PTTEP. Watch video of the fire here. Thankfully nobody was injured. The cause of the blaze is not known. Oil, gas, and natural gas condensate have been spewing from an uncontrolled well on the platform since August 21 (73 days ago). MODIS / Aqua image taken on November 2, 2009. See more SkyTruth images here. This will certainly complicate the effort to gain control of the leaking well. And if the fire destroys the Montara platform and the attached West Atlas drilling rig, as some observers are now suggesting, then we may never learn exactly what happened to cause this blowout in the first place. On the plus side (trying hard to be optimistic here), if the fire is burning off most of the leaking hydrocarbons, then the area of ocean impacted by oil slicks and dispersants should greatly diminish. Working from the nearby West Triton relief rig that drilled the intercept well, heavy drilling mud will be pumped into the damaged Montara well until the flow of hydrocarbons is shut off. That should promptly extinguish the fire. The fourth attempt to kill the out-of-control well on the Montara platform was scrubbed due to equipment problems. The well has now been leaking oil, gas and condensate for 70 days. And the operator, PTTEP, is now saying the well may not be plugged for “several more weeks.” Indonesia officially confirmed that oil has reached their territorial waters, something we documented in satellite imagery back on September 3. World Wildlife Fund just released a report on their research cruise to the spill-affected area, where they observed slicks and impacted wildlife. See their photos and video for an up-close look, and get the full report here. (Photo #4 shows researchers studying a SkyTruth image of this spill.) The Australian government has also released a report on the research and wildlife surveys they’ve conducted so far in the area. Common Noddy recovered from the Montara oil spill by researchers working for the Australian government. Photo taken from their report. Meanwhile, a second leaking well has been reported in another offshore field about 50km northwest of Montara. This is being described by the company as a minor gas leak but it’s been ongoing for some time with no immediate prospect for repair. Fugitive methane emissions such as this from oil and gas facilities could be a major source of greenhouse gases in the atmosphere. See all of our images here. And if you like what we do here at SkyTruth, please support our work!